From Ardusat to ARKYD, space startups are bringing space exploration and participation down to Earth. How? Thanks to years of microchip and sensor miniaturization, we are now making useful satellites shockingly tiny, powerful, and affordable. And recently, one design in particular, the CubeSat, has become near-ubiquitous in the race to throw open the door to space exploration. According to the Space Review, as many CubeSats as have been launched in their history (50 or so) are planned for launch this year (50 to 70). These days, launching a CubeSat falls within most university research budgets. And indeed, universities make up the majority of launches, though well-heeled or Kickstarter-funded students, hobbyists, and artists aren’t priced out of the equation either. The base CubeSat is 10 centimeters to a side and, depending on what you put in it, weighs up to a kilogram. CubeSats are designed to be scalable along one axis. A 2U satellite is 20 centimeters long, 3U is 30 centimeters long, and so forth. Anyone can put a small satellite into orbit if they can figure out how to engineer it and pay for the ride. The only regulatory requirement in the US is a NOAA license for satellites that “sense” the Earth’s surface by way of “emitted, reflected, or diffracted” electromagnetic waves (think high powered cameras, radar, etc.). Because CubeSats are a standard size and weight, they are compatible with standard deployment systems like the Poly-PicoSatellite Orbital Deployer (P-POD). P-PODs accommodate three CubeSats and can be attached to rockets as secondary payloads, making it easier than ever to hitch a ride into orbit. Most of today’s CubeSats ride on other commercial or government rockets at a steep per pound launch cost. But as private rocket developers like SpaceX make cheaper rockets, we’re likely to see more affordable launches in the future. SpaceX’s Falcon Heavy, due to launch later this year, may slash launch costs to under $1,000/lb. Building and programming decently powerful satellites is getting cheaper and easier too. Some CubeSats even boast Android phones for brains. Why build hardware from scratch when smartphones contain miniature “sensors, cameras, GPS, batteries, accelerometers, compasses, [and] data storage”? What other creative uses are folks finding for CubeSats? Interorbital Systems, a space exploration company that specializes in small satellites, offers a list of applications including imaging, research, space art, and space burials. 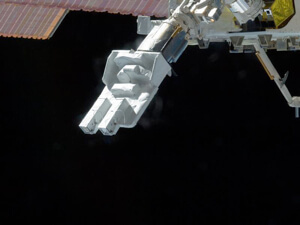 The Japanese FITSAT-1 has been flashing morse code from orbit since late last year. Project Calliope will convert the ionosphere into free sound files for all to hear and perhaps mix and remix into music. Maybe these seem a bit frivolous. But the fact there’s even room for frivolity is hugely promising. The more small satellites we can engineer and launch, the better and faster we can hone our designs. As space research moves beyond the elite few, the pace of space technology will accelerate. It’s about time, don’t you think?